Technology is notoriously one of the most rapidly changing inventions of the modern day, but equally as essential to a more efficient modern life. It can often feel like you’ve been left behind when you spend a day without your cell phone or internet access. For disabled and/or chronically ill seniors who are confined to their homes and don’t have frequent visitors, that feeling is unfortunately all too common. While the pairing may seem bizarre at first, teaching technology to seniors can make their lives more enjoyable and help foster a sense of connection to the world. 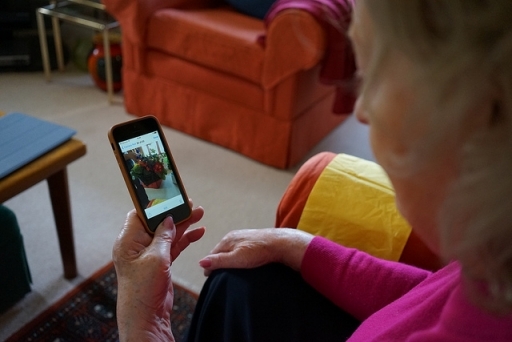 For homebound seniors, an internet connection acts as a lifeline to the outside world and can provide endless entertainment as well as a sense of belonging. Particularly for the elderly with mild dementia or diminished eyesight that causes difficulty reading texts and books, watching videos online or programs on television can be a great source of comfort. It is estimated that only 60% of seniors know their way around the internet. If they don’t already know, teach your elderly parent or loved one how to browse the internet for educational and entertainment programming. Seniors who are confined to their environments are particularly vulnerable to depression due to isolation and loneliness. Encourage your parent to connect with family and friends by showing him/her how to navigate social networks and how to use video calling software like Skype to connect with children and grandchildren who are unable to visit. Make typing easier by investing in dictation software for seniors who have arthritic difficulties or are unable to master the keyboard. If you are unable to take the time to teach your parent these technologies, ask your parent’s home care aide to take some time each day to do so, or research community initiatives that connect student volunteers with seniors. Knowing tech basics isn’t just for homebound seniors. For otherwise healthy adults who are aging, connecting to others via social media and online communities is extremely beneficial in combating loneliness and encouraging a sense of purpose. Tablets and smartphones make excellent gifts for active seniors who can use the devices to connect, set reminders for medications and appointments, manage finances, and maintain brain function (with games, of course). Take the time to show your parent how to get the most out of these gadgets and install appropriate applications for use when you’re not around to help them. Encourage your parent to join online communities and websites geared toward likeminded seniors where they can discuss issues they face, address medical concerns, and meet new friends. Enroll your parent in a community learning or senior center class where they can not only learn how to use technology, but meet and mingle with others as well. Remember that many seniors have limited or no exposure to or experience with advanced technology; they didn’t grow up with the internet or encounter ever-changing gadgets in their adult lives. BE PATIENT and explain to your loved one the many benefits of getting online and getting connected.